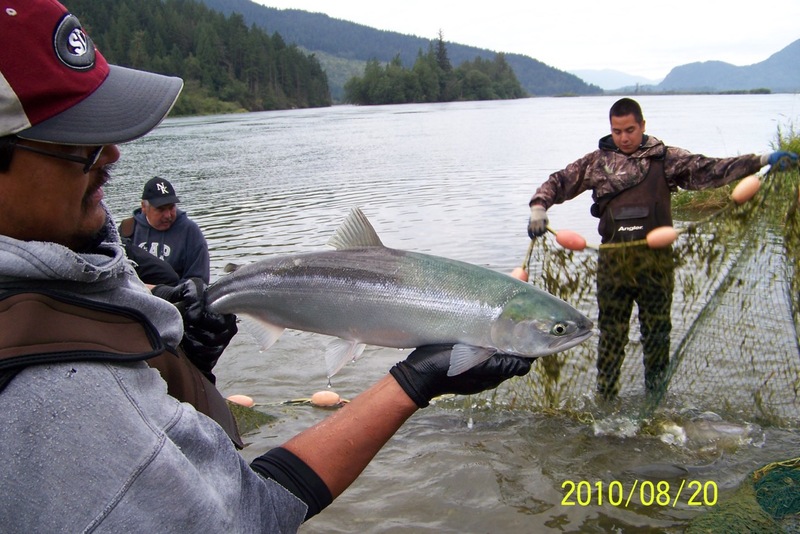 We are the salmon fisheries of Sts’ailes and Scowlitz First Nations located 100 km upstream of Vancouver along the Fraser River. 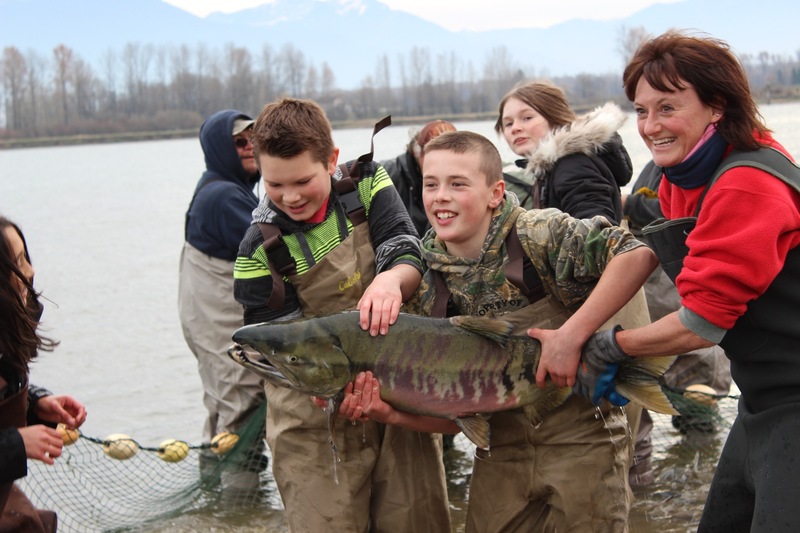 Primarily, the Harrison River salmon fisheries take place in the Chehalis, Harrison and adjacent Fraser Rivers, as well as the lower Lillooet River. 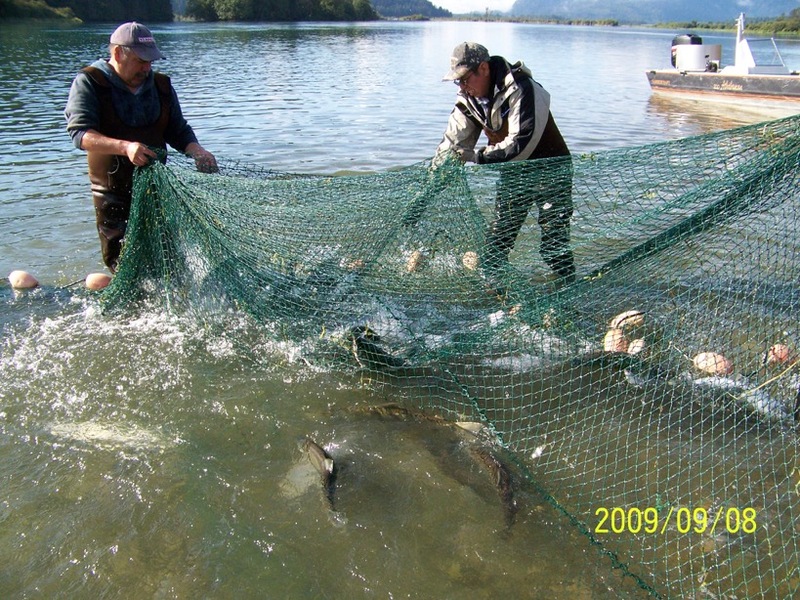 Set and drifted gill nets, beach seine, spear, and trap fisheries enjoy a broad mix of chinook, chum, sockeye, coho, and pink salmon. Historically first salmon ceremonies celebrated the first arriving chinook in March, then a great variety of salmon populations migrate to this area through the summer and fall, and then winter coho and chum fisheries in the tributaries would have completed a year-round salmon harvest cycle. Harrison Select Salmon comes from Canada’s only designated Salmon Stronghold (http://www.fish.bc.ca/harrison-river-first-canadian-salmon-stronghold ) and one of the Fraser Rivers most significant salmon producing tributaries based upon population diversity and health. Located in the heart of Sasquatch Country the origin of the word sasquatch began here from the traditional word Sa:sq’ets. Our mission is to provide high quality salmon products caught in our sustainable community-run fisheries and to re-invest from every salmon sold into local salmon stewardship to protect this important salmon stronghold. 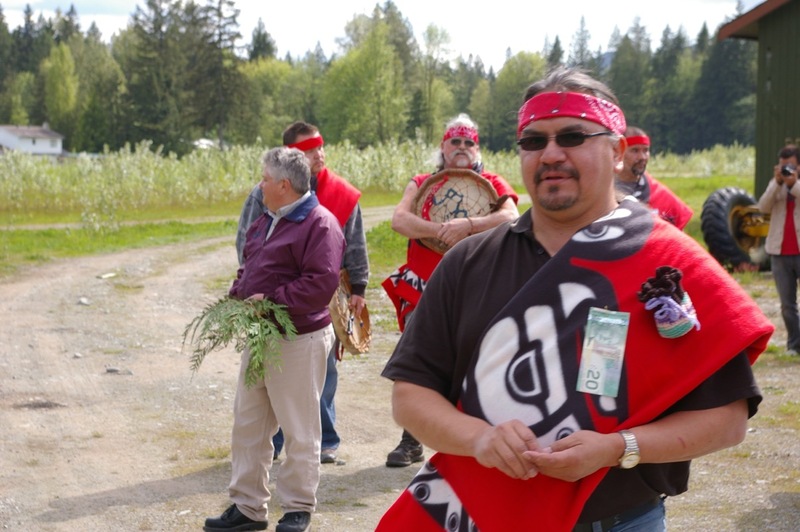 Our first salmon ceremonies timed to coincide with the first arriving chinook salmon each March honour the returning salmon today as they have done for countless generations. 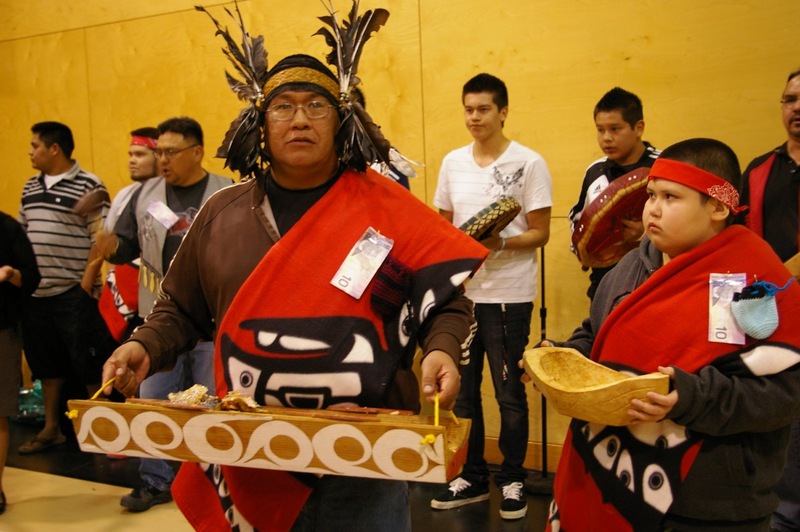 The ceremony culminates with replacing the unused bones of the first salmon back in the river to show the rest of the salmon our appreciation of their return. 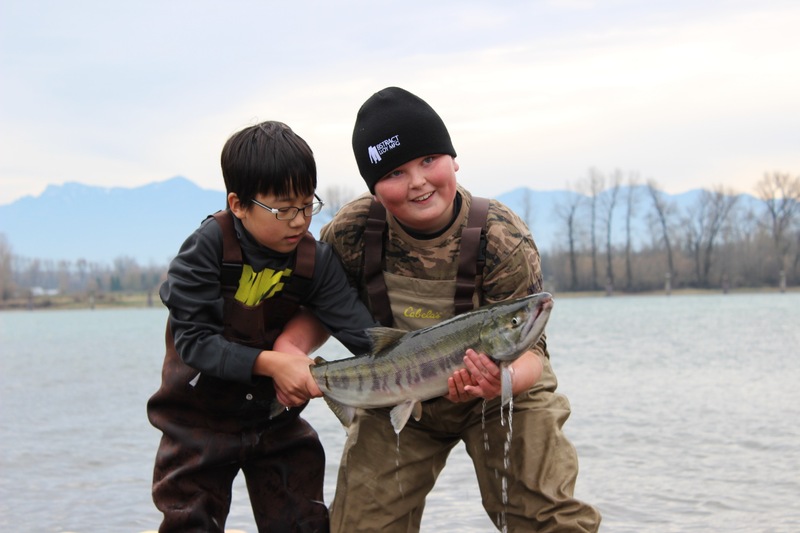 In November Sts’ailes puts on a public Salmon Festival in collaboration with the Fraser Valley Bald Eagle Festival where local artisans and fisheries demonstrations present an opportunity for the public to get up close and personal with these salmon. 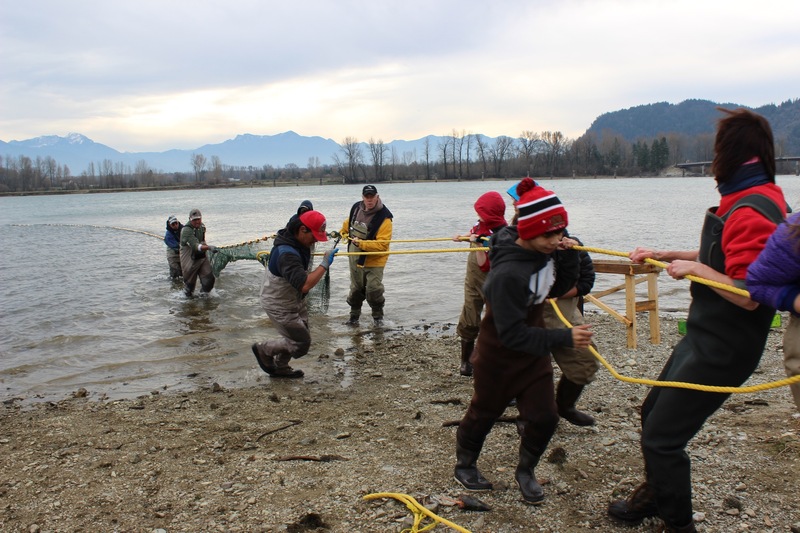 Our community-based salmon fisheries date back many centuries, but modern commercial fisheries have grown over the last 30 years as we celebrate greater abundance as the mixed stock fisheries downstream are becoming more selective. 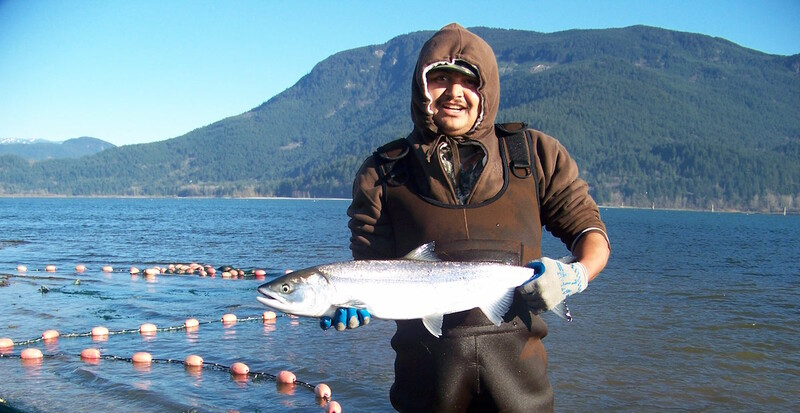 The Sts’ailes and Scowlitz First Nations are engaging their Communities and other co-managers in renewal of their fishery based upon on their historic rights and interests in the fishery, building on their work in stewardship, stock assessment, and management over the last 3 decades. 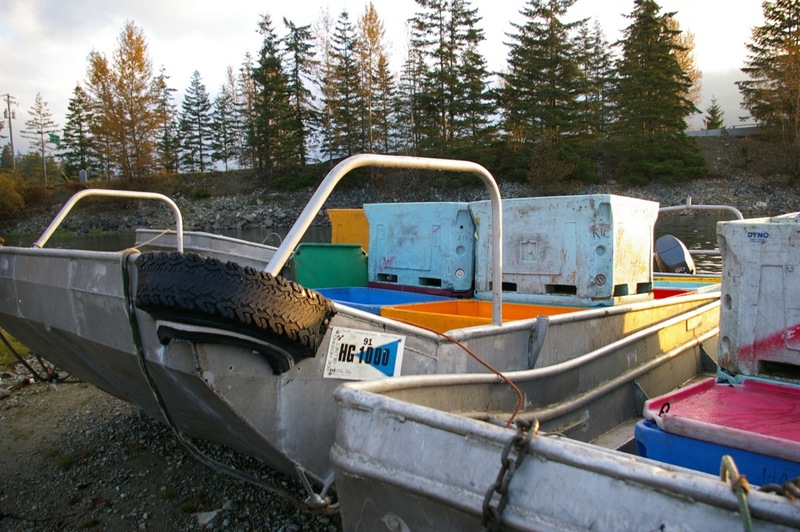 The first modern economic opportunity (or EO) fisheries were organized through the Harrison Salmon Producers General Partnership (HSPGP) in 2012. 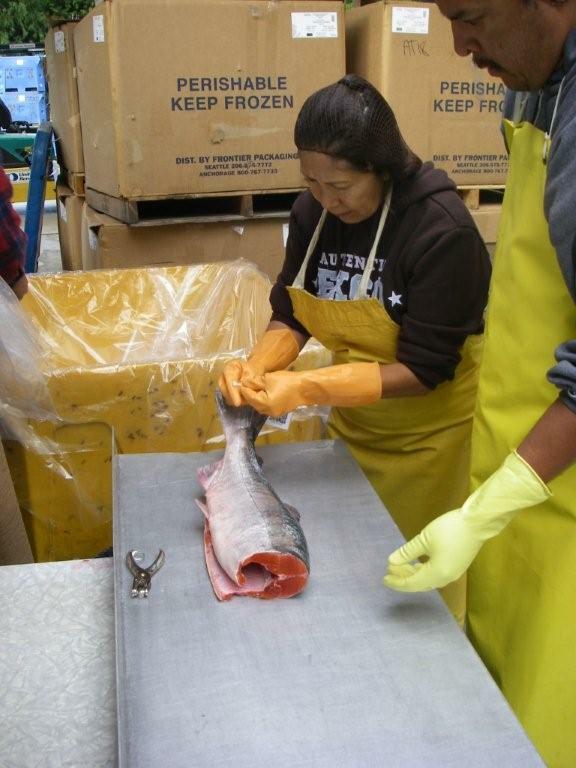 This fishery produces on average 0.5 – 1 million lbs of salmon (sockeye, chum, pink, coho, and Chinook). Harvesting occurs through a variety of methods, locations and times (to ensure selectivity), and operates through a membership of more than 200 designated Community fishers. The cooperative landing site and incentives for entrepreneurial growth recruits the fishers into finding solutions around responsible fishing practices (including effective governance), improved prosperity for fishers (value-adding), and catch accounting (including traceability). 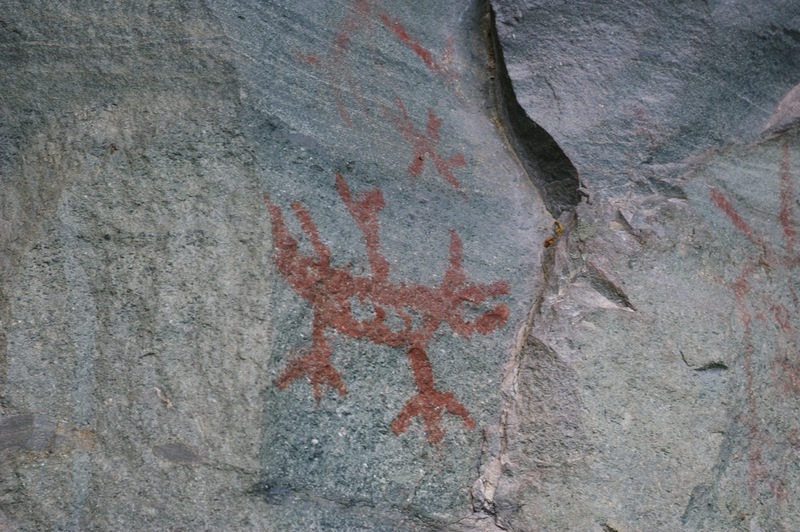 The Sasquatch and the salmon have a long and rich history in Sts’ailes and Scowlitz, for both residents and visitors. 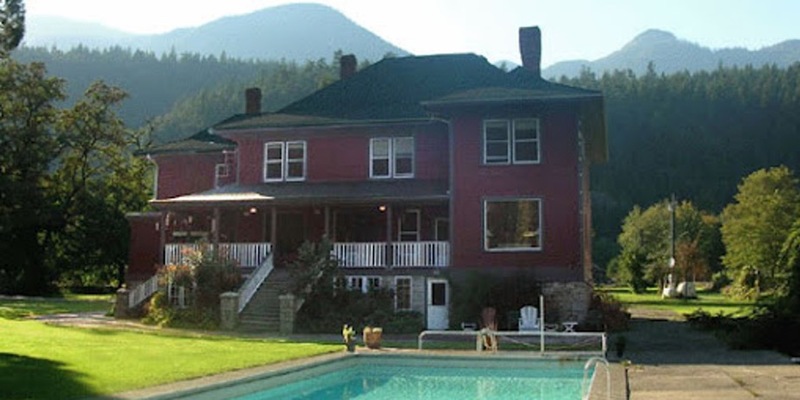 The heart of their traditional territory is the bountiful Harrison and Chehalis Lakes region. For Sts’ailes (formerly Chehalis Indian Band) and Scowlitz the Sasquatch is an important aspect of cultural identity and spiritual beliefs. The very word Sasquatch is an anglicised pronunciation of Sa:sq’ets, a Sts’ailes word, which tells a story of how Sasquatch is the primary caretaker who watches over the land. The Sasquatch is so integral to this First Nation that their adopted logo is a stylized image of the Sasquatch, as is the Sts’ailes national flag – and naturally, their fishing enterprise embraces the salmon logo of their neighbours in Scowlitz. Their experience with the Sasquatch goes back many thousands of years and the legend has been passed down from generation to generation as Xwelmexw – or People of the Land. The form line drawing of Sasquatch is Trade Marked to Sts’ailes and has become an internationally recognized cultural icon. Today it endures as a prominent figure in Sts’ailes cultural practices and laws; is used to brand their community businesses; and to develop new product and service lines featuring this iconic Sa:sq’ets image. According to legend, during the time of those mythic, shape-shifting beings that embodied the Indian world, the Sts’ailes people constructed a weir on the Chehalis River near it’s confluence with the Harrison. The weir served as a device to trap salmon and provided a platform for spearing. The weir spanned the river, and it was functioned so well it cut of the migration of salmon to the spawning grounds and the “forest” Indians living upstream at Chehalis Lake. As the supply of salmon failed the Indians of the lake, disease and hunger overcame them, and the people looked to their Otter Chief for help. He donned his otter coat, transforming himself into an otter, and swam downstream to where he found the weir holding up the salmon. Several attempts by the otter to dismantle the weir to allow fish passage, were repaired each day by the people of the local Village. The repeated damage to the weir greatly alarmed those operating the weir, who were convinced the havoc was caused by the hairy giants who lived in subterranean caverns in the distant mountains to the north. They decided to watch and see what happened, and were astonished to meet a huge otter who spoke to them in their own language. This is how the Chehalis village in the valley first learned of another at Chehalis Lake. They were quick to make a compact with these people upstream, to lift their weir regularly to let the salmon through. For a time, runners closed the gap between the villages, communicating between weirs in the lower and upper river. And, it is said they could be seen at night speeding down the Chehalis trails lit by the torch of a burning salmon head on stick. In time the two villages decided to amalgamate forming a single village between Harrison Lake and the Mouth of the Chehalis River. 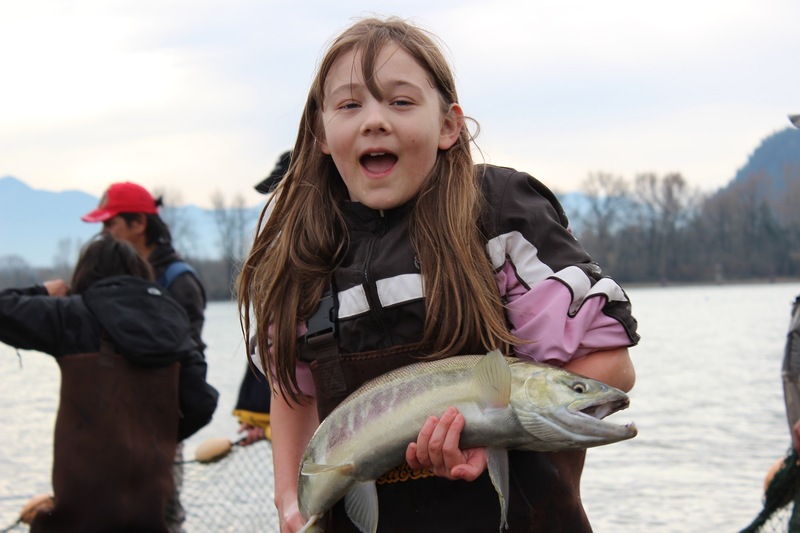 Today, the Sts’ailes continue to depend upon their rich salmon resource, and they take seriously their responsibility to protect the salmon from development, habitat loss, and over-fishing. 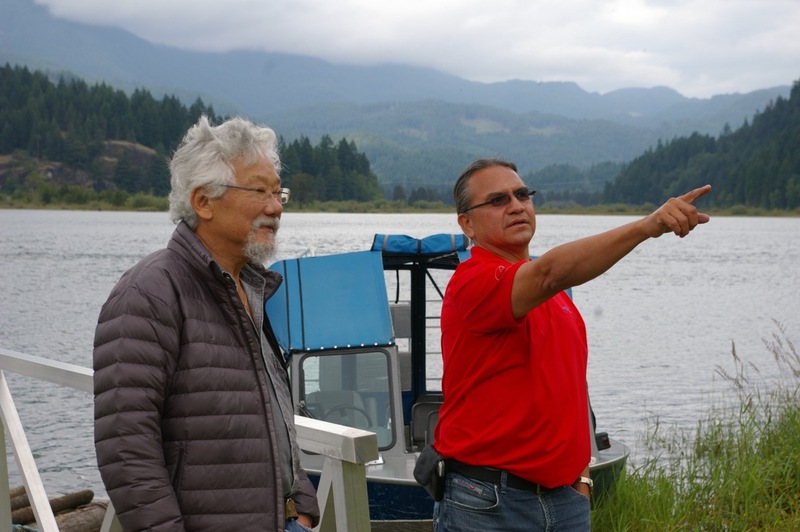 Their vision for the future Harrison fishery includes harvesting for food, social and ceremonial purposes, as well as economic opportunities and includes their leadership in salmon stewardship. Today the Harrison River is a recognized salmon stronghold, sharing this status with several other world renown productive salmon ecosystems. For further information Google “Harrison Salmon stronghold”.